The Alexa.ContactSensor interface describes the properties and events used to report the state of an endpoint that detects contact between two surfaces. For example, a contact sensor can report whether a door or window is open. If your contact sensors are components of a larger security system, your skill can also implement the Alexa.SecurityPanelController interface for a unified customer experience. For the list of locales that are supported for the ContactSensor interface, see List of Capability Interfaces and Supported Locales. Alexa, is the bedroom window open? After the customer says one of these utterances, Alexa sends a corresponding state report request to your skill. A contact sensor typically has two components; a main component and a magnet component. When the components are in contact with each other, the sensor is closed. When they lose contact, the sensor is open. 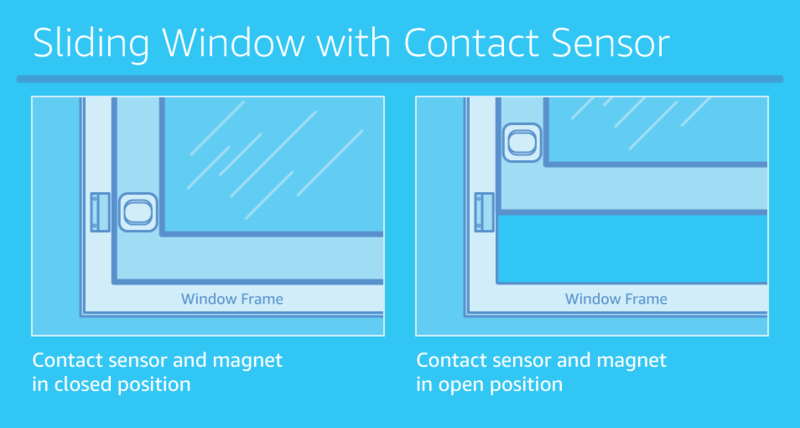 The following image shows the open and closed states of a contact sensor on a window. You describe endpoints that support Alexa.ContactSensor using the standard discovery mechanism described in Alexa.Discovery. For an example discovery response message for sensors, see the discovery example on the Build Smart Home Skills for Sensors page. This interface does not define any directives, but sends change reports when a capability property changes and optionally responds to Alexa's requests for the state of the endpoint. detectionState Indicates the contact sensor state. DETECTED means the sensor is open and the two pieces of the sensor are not in contact with each other. For example, a window has been opened. NOT_DETECTED means the sensor is closed and the two pieces of the sensor are in contact with each other. Describes an endpoint that senses motion.